Ectocarpus is a brown alga. It is abundantly found throughout the world in cold waters. A few species occur in fresh waters. The plant grows attached to rocks and stones along coasts. Some species are epiphytes on other algae like members of Fucales and Laminaria. Ectocarpus fasciculatus grows on the fins of certain fish in Sweden. Ectocarpus carver and Ectocarpus spongiosus are free- floating. Genetically the thallus may be haploid or diploid. But both the types are morphologically alike. The thallus consists of profusely branched uniseriate filaments. There are two systems of filaments. These are prostrate and projecting (erect) system. The filaments of the projecting (erect) system arise from the filaments of prostrate system. 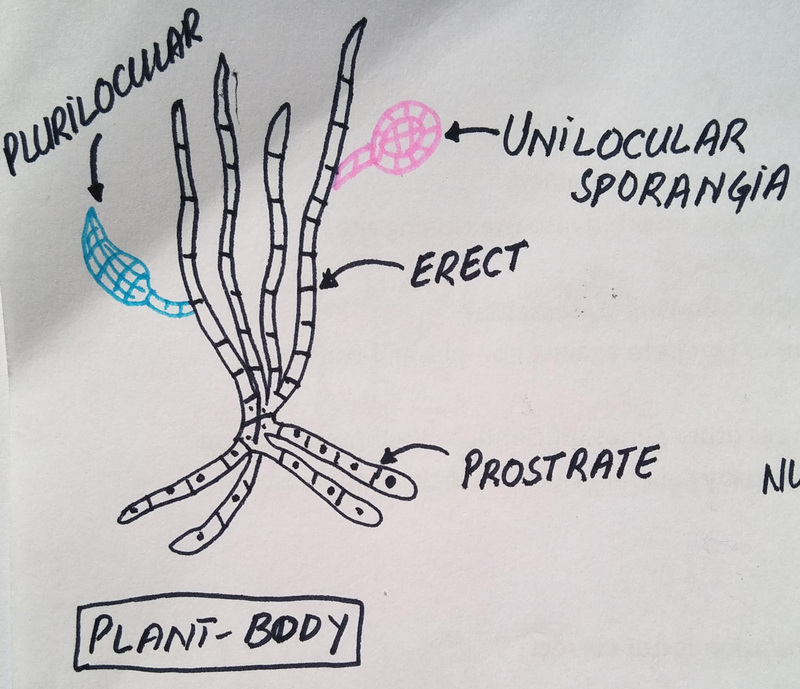 The prostrate system consists of creeping, septate, irregularly branched filaments. These filaments are attached to the substratum with the help of rhizoids. This system penetrates the host tissues in epiphytic conditions. Prostrate system is poorly developed in free floating species. The projecting system arises from the prostrate system. It consists of well branched filaments. Each branch arises beneath the septa. The main axis and the branches of the projecting system are uniseriate. In this case, cells are joined end to end in a single series. The branches terminate into an acute point to form a hair. In some species the older portions of main axis are ensheathed (corticated). This sheath is formed of a layer of descending rhizoidal branches. The cells are small. They are cylindrical or rectangular and uninucleate. the cell wall is thick It is composed of three layers composed of pectic-cellulose. Algin and fucoidan are also present in the cell wall. These are characteristic gelatinous substances of the walls of brown algae. The chromatophores may ribbon-like with irregular outline or disc- shaped. The dominant of Ectocarpus is fncoxanthin. It gives this algae golden brown colour. The other photosynthetic pigments are chlorophyll-a, -c, beta.carotene and other xanthophylls. “Pyrenoid-like bodies-are associated with the chromatophores. All other eukaryotic organelle are present. In some species, an intercalary meristem is present it the base of the hair. It is called trichothallic meristem. It increases the length of the terminal hair and vegetative cell of the branch. This growth is called trichothallic growth. The asexual reproduction takes place by the formation of biflagellate zoopores. These zoospores may be haploid produced in one-celled unilocular sporangia. Or they may be diploid formed in many­ celled plurilocular sporangia. Both kinds of sporangia are present on the same diploid sporophyte plant. The sporangia are borne terminally and singly on lateral branches. The sporangial initial enlarges in size. It becomes globose or ellipsoidal. The number of chromatophores also increases in it. The nucleus of the sporangium divides meiotically to produce four haploid nuclei. These nuclei undergo repeated mitotic divisions to produce 32-64 daughter nuclei. The cytoplasm of the sporangium divides. A small amount of cytoplasm surrounds a nucleus and a chromatophore to produce daughter protoplasts. Each daughter protoplast metamorphoses into a meiozoospore (produced by meiosis). Meiozoospore is pyriforrn and biflagellate. The flagella are laterally inserted and are of unequal size. The larger one directed forward and the smaller one is directed backward. These are separated from each other after few moments. They swim freely in all directions. A new sporangium may be produced within the old sporangial wall after the liberation of zoospores. The plurilocular sporangia are stalked or sessile. These are elongated, cone-like multicellular structures. These also develop from a terminal cell of a short lateral branch. The sporangial initial enlarges in size. It undergoes repeated transverse mitotic divisions. It produces a vertical row of 6-12 cells. These cells then divide by vertical and transverse divisions repeatedly. They form a cone-like structure. This cone consists of hundreds of small cubical cells. These cells are arranged in 20-40 transverse tiers. Each cell represents a sporangium. The protoplast of each cell metamorphoses into a single mitozoospore (produced by mitosis). The mitozoospore is pear-shaped, diploid and biflagellate. The flagella are of unequal size and are laterally inserted. The zoospores formed in unilocular sporangia (meioszoospores) swarm for sometime. They then come to rest on some solid object. They withdraw their flagella and secrete a membrane around then. They germinate and form a small germ tube. This tube is separated prom the meiozoospore cell through a septum. This germ tube divides and redivides. It forms the prostrate system of plant. The projecting system arises from the filaments of the prostrate system. The new plant form is haploid. Therefore, it is gametophyte. The meiozoospores develop into a gametophytic plant. Therefore, these spores are also called as gonozoospores. The zoospores proauced in plurilocular sporangia are mitozoospores. They develop in the same manner as the meiozoospores. But they are diploid. Therefore, they develop into a diploid sporophyte. Therefore, the mitozoospores are also called as neutral spores. Sexual reproduction takes place by isogamy or anisogamy. Majority of the species are isogamous and homothallic. Ectocarpus secundus is heterothallic and anisogamous. The gametes are produced in plurilocular gametangia. These gametangia are many-celled, elongated, and sessile or shortly stalked conical structures. These gametangia are produced on the haploid plants developing from the meiozoospores. The development of gametangia is similar to that of plurilocular sporangia. I. These develop from terminal cell of a lateral branch. The gametangial initial gets inflated. It divides mitotically by repeated transverse divisions. It produces a vertical row of flat cells. The protoplast of each cell metamorphoses into a single, pyriform, biflagellate, haploid zoogamete. The flagella are laterally attached. The zoospores and the gametes are similar in structure. But the gametes are relatively smaller in size. Fertilization occurs and diploid zygote is formed. There is no zygotic meiosis. The zygote germinates into a diploid sporophyte. It develops two types of sporangia. Zoospores are produced in these sporangia. Zoospores are produced by mitosis (mitozoospores) in plurilocular sporangia. The zoospores in unilocular sporangia are produced meiotically (meiozoospores). The mitozoospores germinate into a diploid sporophyte. These spores cause reduplication of sporophyte generation. The meiozoospores germinate to give rise a haploid gametophyte plant. These gametophytes are similar to the sporophyte in morphology. Haploid gametes are produced in the gametangia. These gametes fuse to form a diploid zygote. Zygote germinates into a diploid sporophyte plant. In some species the gametophyte generation is also reduplicated by the parthenogenesis. In this case, the gametes from plurilocular sporangia form new gametophyte generation.